If you are looking to succeed online within the B2B sector it’s absolutely necessary to be involved in content marketing in some capacity. B2B decision makers are searching the web looking for answers to the questions that they have and solutions to the problems that they have. The kind of content that should be created on behalf of a business should be informational. It allows a business to be presented in a positive light as an industry insider and source of knowledge. The purpose of creating informational content is to be found when someone is looking for what you have to offer. Because the B2B sales cycle can be long, the content that is shared over time can help educate prospects and allow them to establish a connection with your business. When it comes time to make a decision, your business will be top of mind. What many B2B content marketers struggle with is creating the kind of content that will actually attract potential customers and keep them engaged. A common mistake is writing content that is too promotional. It only talks about the features of the products or services that are offered. This kind of content is really no different than an advertisement and gets old after a while. Potential customers want to know more than “how great you are”. They want to learn about the industry and how to solve the individual problems that they are having. B2B content should be information based without specifically mentioning your own products or services. “How are we marketing what we have to offer if we aren’t mentioning what we have to offer?” you may be wondering. Well, the whole point of B2B content marketing is that it’s an indirect way to market a business. Instead of throwing your products in the face of a prospect, you are putting your knowledge out there in order to earn respect. As B2Bs move away from promotional content and start creating informational content they are often left wondering, “OK, so what do I write about?” It can sometimes be a challenge to uncover topic ideas, but they are certainly there as long as you are willing to do a little digging. There are plenty of places to look for inspiration. You can start by taking a look at other industry publications. If you are a good marketer you should already be keeping up with industry news and trends by reading industry publications and industry blogs. What are others in your industry talking about? Put your own spin on a particular topic and address how you might handle the situation. Don’t merely copy what is already out there. Another source of topics is your customer service team. They work with clients and customers directly on a daily basis. They know what kinds of questions and issues people may be having. Every question is potential content material. It’s also worth talking to other internal teams within the business that deal with customers or clients directly, like consultants or the sales staff. 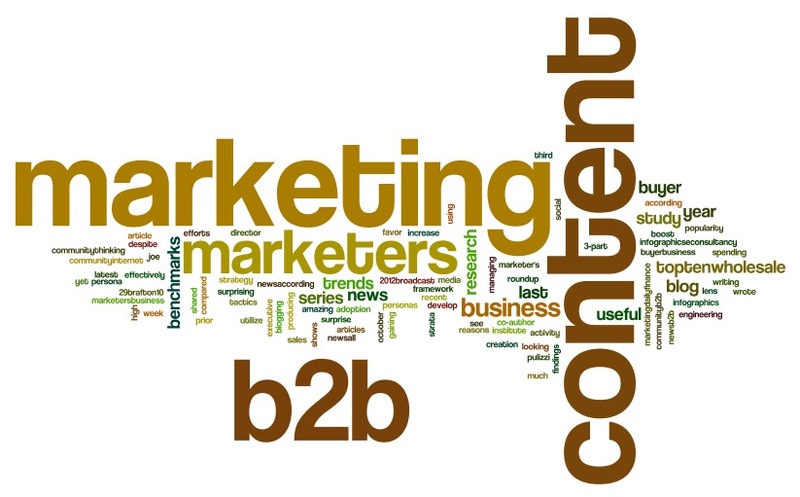 B2B content marketing can be challenging, but it’s not impossible. Don’t overthink things. The only goal is to create content that people will find beneficial and that will portray your business in a positive manner. Nick Stamoulis is the President of Brick Marketing, a Boston based SEO services firm. For more information please call 781-999-1222 or visit http://www.brickmarketing.com.